KISS has completed recording its new album, "Monster", for a summer release. Songtitles set to appear on the CD include "It's A Long Way Down", "Back To The Stone Age", "Shout Mercy", "Out Of This World","Wall Of Sound", "Born To Be A Sinner", "Are You Ready" and "Hell Or Hallelujah". Speaking to VH1 Radio Network's Dave Basner following yesterday's (Tuesday, March 20) press conference at the Hollywood Roosevelt Hotel in Hollywood, California to officially announce details of KISS' summer co-headlining tour with Mötley Crüe, Paul Stanley stated about the band's new CD, "'Monster' is really the culmination of everything this band has been in the past and where we're going. When we did [2009's] 'Sonic Boom', it was a big task for us because we were saying, 'How do we define who we are today without losing who we've been?' So, that was a tall order for us, but once we got that under our belts, we wanted to go back in and 'Monster' is far, far beyond anything we've done in terms of 'Sonic Boom' and yet it's right up there with some of the best stuff we've done. 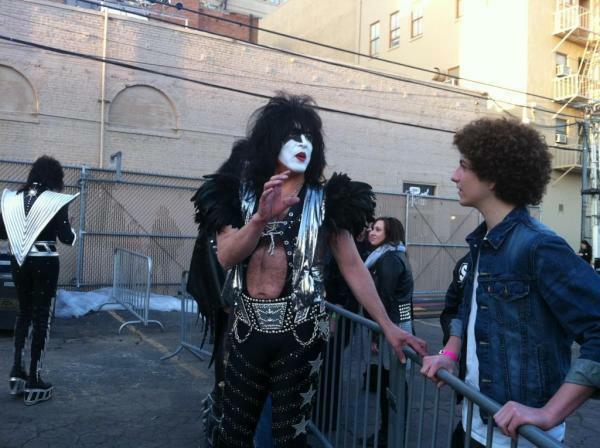 It's KISS." So is there a single coming soon? Paul told VH1 Radio Network when to expect it and if it has a name. "It should be right around the time of the tour," he said. "It does have a name but we haven't chosen it yet. I think our problem right now is that we have 13 great songs and any one of them has possibilities." "It is done, it is done. It's fighting to get unleashed." said Stanley. " We're trying to keep it under wraps. The single will precede it. The album is, I have to say, just blowing us away. We're so proud of it. It's everything that's made KISS what it is, and then some. Sonically, it's phenomenal. And the songs are just great. "We're big believers at this point that great music isn't made by looking at a computer screen. ... It was about feel, not perfection. Most of these songs were done in one or two takes. What you gain by getting something perfect, you lose so much in terms of feel. This album is feel, but it's bombastic."